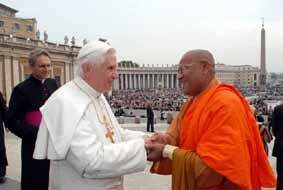 Ven.Banagala Upatissa Nayaka Thero,President of the Mahabodhi Society of Sri Lanka,Chief Sangha Nayaka for Japan called upon His Holiness the Pope Benedict XVI at the Vatican on Oct.10 2007.
juria International. CSL.ceylon shipping lines japan.Ceylon tea.sri lanka. juria tea. juria uses car shop.Ceylon Tea Shop.